Serious modern funk dance floor jams and steppers here. Not a bad tune in the bunch. The funk and vinyl junkies at Stones Throw we’re kind enough to issue this in a 7” box set with the instrumentals of every song on the B-side. In the words of the Holy Ghost of Funk, Bootsy Collins: "Well glory be! The funk's on me!" 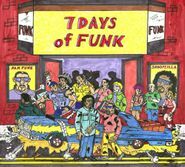 7 Days of Funk's debut EP is a revelatory event for for fans of and freaks for The Funk, and should be particularly pleasing for those whose funk du jour is syrup-thick mid-tempo boogie-funk seasoned heavy with synthesizers a la Yarborough & Peoples or Zapp. This latter strain of funk has seen a resurgence in recent years, aided in large part by Angeleno Dam-Funk who makes up half of 7 Days of Funk's funknamic duo. Who's the other half? None other than the Doggfather himself, Snoop aka Snoop Lion aka Snoopzilla for this release, in an explicit homage to the Bootsman. Snoop has flirted with throwback funkestries on previous releases and is responsible for the global dispersal of the G-funk sound, but never before has be given himself so wholeheartedly to the funkmersive concerns expressed on this EP. Easily transcending the side-project ghetto, 7 Days of Funk is two major voices in contemporary music, subsuming their individual identities into something new and simply huge. A match made in funk heaven.